DermMatch outperforms all hair fiber concealers. It looks better, stays on better, applies neater and costs less to use. We guarantee it. No product in the world makes your hair look as thick and full as DermMatch. Hair fibers can’t compare to DermMatch Topical Shading. DermMatch looks better, stays on better, applies neater and costs less to use. We guarantee it. Botanical ingredients in DermMatch coat the entire hair shaft. Thin hairs thicken, stand up and spread out for spectacular fullness. Ultrafine powders in DermMatch blend right in with your skin and leave your hair looking thick, smooth and natural. Hair fiber concealers drop tiny particles down around your hairs. They don’t coat or thicken the hair shaft like DermMatch. They don’t add any lift to your hair, so you don’t get the same fullness. You can dive in a pool or sweat at the gym with DermMatch. Go ahead and brush your hair. DermMatch stays on. Don’t try this with hair fibers. Hair fibers can fall off if you bend over. You can never brush your hair or swim with hair fibers. Only DermMatch gives you EZGrip, EZReach applicators. They make application quick, clean and precise. You can create natural hairlines, temples, eyebrows and beards. Hair fibers rain down uncontrollably from a jar. Hair fibers don't give you any control. DermMatch gives you perfect control at your fingertips. DermMatch is a solid. It lasts a very long time. The average reorder time across all customers is 8 months. 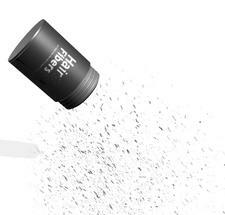 Hair fibers come in a jar full of air. One solid disc of DermMatch lasts much longer and costs you less to use.